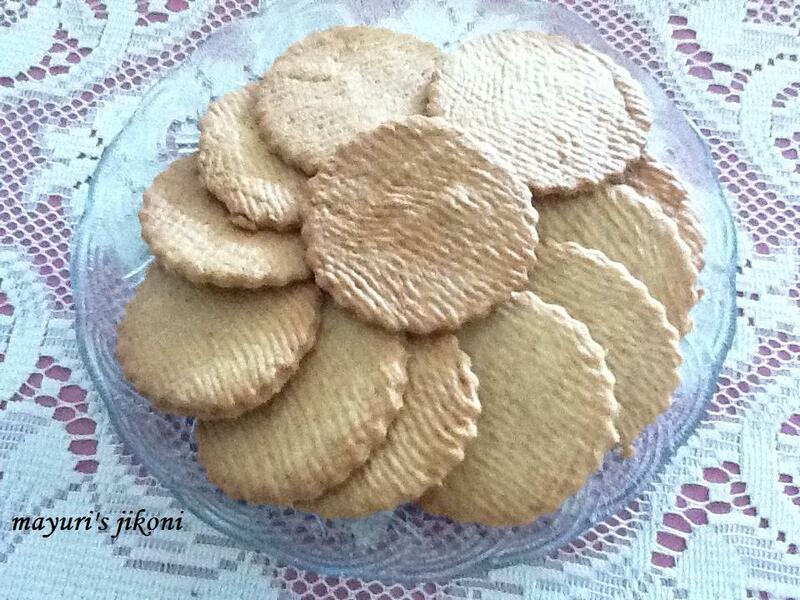 When I was growing up, the only biscuits that most Gujarati families in Kenya made were the rolled biscuits. Its only when numerous recipe books started coming out into the market that I tried my hands at other types of biscuits or cookies. I remember, my mum would make these biscuits on a Saturday so that I could help her to bake them. Perhaps thats where my passion for baking began. Later when my brother Sailubhai got married, Chandra bhabhi had to make the dough for the biscuits while my kaki and I would bake them. I remember bhabhi would comfortably sit on the floor, put the butter and sugar in a large basin and cream it till it was absolutely white and fluffy. There were no fancy machines back then. Her hand was the machine. A huge family meant a lot of biscuits. I had not made these rolled biscuits for a very long time as I prefer where you just roll the dough between the palm and bake. These biscuits though very yummy, are time consuming. I decided to bake some and take them to India for my in laws. Glad I did that otherwise the recipe would have been forgotten. This recipe is Chandra bhabhi’s, the only change I have made is the amount of sugar as hers is definitely for diabetics. Sieve the flour with the baking powder, custard powder and soda bicarbonate. Mix in the cardamom powder. In a large bowl, cream the butter and sugar till it light, creamy and fluffly. Add the milk and mix it well. Fold in the flour mixture and make a dough. Don’t work on it too much otherwise it will become gluteny and difficult to roll. I usually roll out the dough directly onto the tray. You may need to use a bit of flour to roll out the dough. The thickness of the biscuit depends entirely on your preference. I like the thin ones. Cut out the rolled dough with a cookie cutter. Remove the excess dough. Prick the biscuits lightly with a fork. Bake the biscuits for 15 to 20 minutes till they are light golden brown. Remove them from the tray and let them cool on a wire rack. Instead of cardamom you can use 2 tsps nutmeg powder or 12 tbsps of ginger powder. I used half he recipe to make the biscuits. Remember to re use the excess dough.